Ornithologist Alar Broberg who studies the Eagle Owl in Sweden sent this message today after reading the blog entry about "Oscar" Bristol's Eagle Owl death. Just to remind everyone, its thought that Oscar was injured and died after attacks from Gulls and Crows, so here is Alar's response to that. I had a few sec free time, so I checked your blog –spot. The only occasion I can imagine that an EO is killed by gulls and crows if it’s in a very bad health status. Sick or very poor luck with catching food. I have never heard about this happening, the only ones that kills EO is another EO or perhaps an Eagle. So far it’s pretty good year , and we had one day “all time high ringing in the archipelago”. 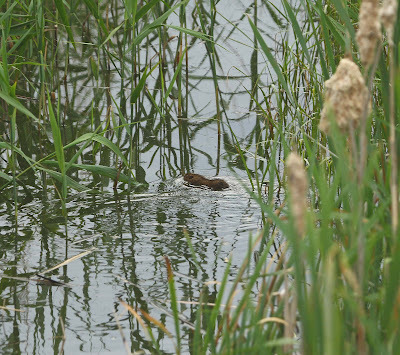 Usually that area has about 5 chicks, and the previous was last year), last Monday I rung 12 ( 7 clutches). My Thanks to Alar for taking the time to respond to this. Sadly the body of Oscar has been disposed of, obviously an autopsy to find any underlying reason why he died would have been good. And so after reading Alar's response it does make me wonder whether he may have been poisoned, this comment from me is really jumping to a conclusion and only based on the fact that Oscar was catching Rats in the City, therefore I would assume Rats in the City are targeted for poisoning. Stands to reason if this happened his health would have deteriorated to a point were by the Gulls and Crows may have picked on him. At the end of the day we will never really know and without the evidence from his body then we only have rumour and unsubstantiated evidence. 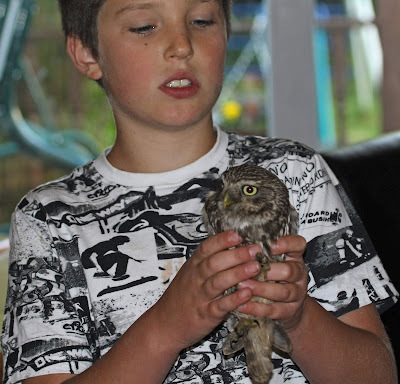 Thanks to the many of you that have e mailed regarding Oscar the Eagle Owl. 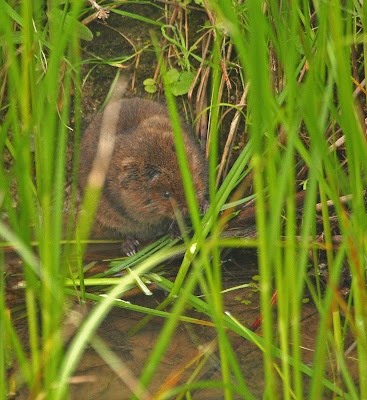 More from the Water Voles later on this week, stay tuned! 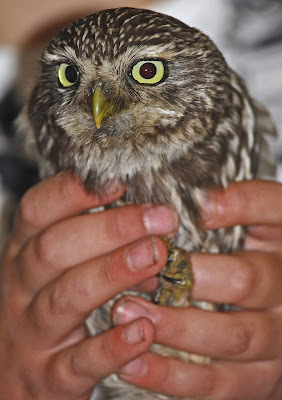 Quick thinking member of the public came to the rescue of this Little Owl at Portbury. The Owl was found on a path being perhaps picked on by Magpies? When we got the owl we could see no sign of damage just a few pulled feathers, and bit under weight and so obviously suffering from shock. Now at this time of year this adult could be a parent Owl, so time is of the essence. We had to get the bird back, if it could go back, as quickly as possible. We kept him in a dark warm container for a few hours this to help him recover from any shock. Then fed him, and left food with him. After picking him up late Saturday afternoon, by 2300hrs, he was starting to pull round a bit and move around his box. Sunday Morning 0600 revealed he had eaten a lot, and was bouncing around his box, great! However we did not know if there was any unseen wing damage, so at 1200 hours he was flight tested. OK not bad, leave him few more hours and see. 1700 hours second flight test, yippee bloody perfect! Elevated from the floor straight up with no problem at all, also good direct forward flight. Decision made is Little Owl to returned to site by 1900hrs, this in case any young were down to being one parent family and needed help. Took him back to the site on time and released in ideal Little Owl habitat exactly where he came from. Turn around of this Owl was, well about 24 hours, not bad eh! I could have not done this without the help of Thomas Sperring aged 9 and 3 months, after he becoming inspired by his visit to see Jemima Parry Jones at NBPC, and of course the fact that his favourite bird the Little Owl needed help, so Tom really came up trumps on this one, and he really did help with feeding and looking after. Well done Tom this successful turn around is down to you. This sad news came from Ed Drewitt of the BOC. Oscar Bristol's Eagle Owl has been found dead. Apparently the victim of Gulls and Crows. 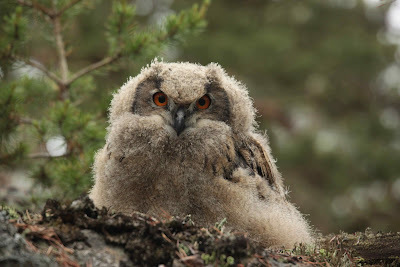 If the boys studying Eagle Owls in Sweden are reading this please comment on this and tells us whether Stockholms Eagle Owls suffer the same fate? Oscar did a great job not only promoting wildlife interest in the city Bristol but also for Eagle Owls and their presence in UK. He did not like some so called experts said he would, catch Dogs and Cats, chase small children and pick on rare birds. Instead he munched his way through Grey Squirrels, Brown Rats and Feral Pigeons. And where there's life, then we always have hope!